Dustin Beeber is a singer who is enormously popular among young girls. 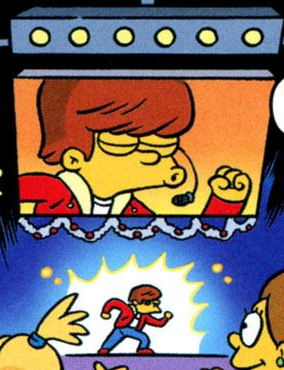 The boy that the girls should kiss during one of the annual mistletoe runs was Bart Simpson. The first prize was two tickets to a Dustin Beeber concert. The winner was Marge who took Bart with her, much to his irritation. Dustin Beeber is an obvious parody of Justin Bieber. Comic story – Kiss Me, Bart Simpson! Modified on January 27, 2017, at 16:50.